Directed by Alejandro Amenábar, the Chilean and Spanish director most known for the film The Others (2001) and his Academy award-winning film The Sea Inside (2005), Agora was released in 2009 in the US by Newmarket Films, and focuses on the philosophical work of Hypatia in late fourth-century Alexandria, Egypt amidst political and social turmoil resulting from clashes between Christians, Jews and Greco-Roman polytheists. The film begins with the depiction of Hypatia (Rachel Weisz) as a teacher at a Platonic school that molds future leaders of the Roman Empire, including Orestes (Oscar Isaac), the eventual prefect of Alexandria, and Synesius (Rupert Evans), who would become the Bishop of Cyrene. She discusses philosophy and astronomy, such as the motions of the Sun, the Moon, the five known “wanderers” (planets), and the stars, while specifically focusing on questioning the geocentric model. Meanwhile, social unrest ensues in the city as pagans and Christians come into conflict. A Christian mob overpowers the pagans and lay siege on the Library of the Serapeum, where Hypatia takes refuge. 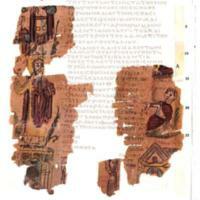 The Roman Emperor Theodosius I pardons the pagans but allows Christians to raid the library and destroy its books. Several years later, Hypatia remains investigating her theories on heliocentrism but, because of religious objections, the Christians who are now fully in control of Alexandria, forbade her from teaching at the school. She continued her studies at a distance but her influence and knowledge remains a threat to the Christian leaders. This leads to her death at the hands of a mob supported by Cyril (Sami Samir), the Patriarch of Alexandria. The film’s treatment of gender relations and religious difference are presented in particular characters and specific scenes, which offer in-depth analysis of these themes. The first act of the film focuses on Hypatia and her work as well as her relationship to her pupils, in light of her status as a female teacher. She is acknowledged by her students as an accomplished and influential scholar and is presented as a beautiful woman that prefers intellectual and spiritual fulfillment to the role of wife and mother (Greydanus). She neither seeks nor accepts suitors and this is evident in a particular scene with one of her students. When Orestes publicly professes his love for her, during a class meeting, she offers him a bloody menstrual towel to show him that love is not always pretty and has its setbacks while intellectual pursuits do have the same drawbacks. Furthermore, through depictions of her relationship with other citizens, including pagans, Christians, scholars, and slaves, she proves that she is not only an expert in her teachings but also a just and chaste individual who rises to the pinnacle of civic virtue (Damascius). Apart from Orestes, her house slave Davus (Max Minghella) also becomes infatuated with her. When he sides with the Christians during the siege of the Serapeum, he starts sexually assaulting her but quickly regrets his actions and offers her his sword after which she decides to let him free once and for all, proving her merciful nature. Although the vast majority of the city loves her, as a powerful pagan woman, she is deemed much too dangerous to the rising power of the Christians. Cyril then convinces a Christian mob that she is a witch, given her role as a mathematician (which translates into opposition to the church), and she is captured and skinned alive. Davus, however, convinces the mob to stone her and, while they leave to go find stones, he secretly suffocates her to spare her and tells the mob she fainted. As far as the depiction of religious difference in the film, there are particular scenes where distinct faith traditions clash, during which audience members constantly shift their attention and often their opinions as to which religion should be viewed as the most “evil” one. During the first act, Christian philosopher Ammonius (Ashraf Barhom), leads a group of Christians to defile the statues of the pagan gods but are met by pagans, including Orestes, who momentarily suppress their actions, but as a violent battle rages on, the pagans find themselves outnumbered and take refuge in the library to which the Christians then lay siege. Although it is not presented in the film, the same year this supposed battle takes place (391 AD), Roman co-emperor Theodosius I outlawed paganism, which had been relatively tolerated for several decades following the Edict of Milan in 313 AD (Gibbon). The film depicts these “Theodosius decrees” in the form of a pardon to the pagans by the Emperor resulting in their exile and the sack and burning of the library. The second act of the film opens several years following the rise of Christian rule in Alexandria and portrays a new religious conflict between the Christians and the Jews. There is a scene where the black-robed Christian militia, called the Parabolani (a group Davus has become a member of), interrupt a Jewish gathering and stone several Jews. This is met with a vengeful stoning by the Jews, who become the target of a pogrom later in the film. The underlying factor within these clashes, however, is the influence Christianity and its leaders, who dominate the political arena and therefore also make sure to maintain their status as the true rulers of the city. In the end, Hypatia becomes just one of the many victims of this constant struggle of power amongst the different faith traditions of the region. 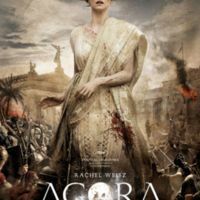 Although the film has many historical inaccuracies— such as Hypatia’s age (she was closer to 50 or 60 years old), her realization of a heliocentric universe, and the manner in which she died (she was actually beaten and flayed to death)— most of the criticism of the film comes from religious Christians who argue that Agora presents Christians in a bad light (Mark) and in an inaccurate way (Barron). Joshua J. 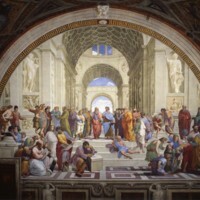 Mark, however, argues in response that “to deny those actions of the early church in trying and trying to replace the faith of the past, seen as repellent in today’s climate, is as dangerous as trying to deny or gloss over the foolish things one did in one’s own youth” (Mark). The film then is critical of the times in which Hypatia lived, while also presenting a fictionalized version of her life, with the trappings of a blockbuster epic with fast-paced action and adventure. Greydanus, Steven D. “A History of Violence: Agora, Hypatia and Enlightenment Mythology | Decent Films - SDG Reviews.” Decent Films, decentfilms.com/articles/agora.